Hey y'all, I'm Susan from Adventures in my Kitchen! I started blogging in 2011 as a way to keep track of my culinary creations while striving to create super tasty yet healthy and energizing meals. Along the way I discovered first hand that food is fuel, lost almost 20lbs, and also I got back in touch with my creative side. I absolutely love blogging and the community surrounding it! I bake my donuts in a Wilton Non-Stick Mini-Donut pan that I got from Amazon. I'd be a big tease if I showed you this nummy donut recipe and left you pan-less, so I am giving away a $10 Amazon.com gift card so you can buy your own! I won't make you wait much longer, just wanted to say thanks to Carrie for having me over! Dear readers, I hope you love these donuts and come over to join the Adventures in my Kitchen! In one bowl, combine flour, sugar, baking powder & salt. Combine well. Add buttermilk, eggs, melted butter, & extract. Beat with mixer on medium until well combined. Fill donut cups about 1/2 full- I suggest piping them with a pastry bag or ziplock with the a corner cut. Bake for 5-10mins or until puffed up and tops spring back when lightly touched. Remove to a wire cooling rack- once donuts have cooled make the glaze. Mix all ingredients except the shredded coconut until combined. Let sit for a few mins to thicken up a little bit. Place shredded coconut on a plate for dipping. After donuts have cooled, dip the entire donut in the glaze and then roll completely in the shredded coconut. Now get to entering for that $10 Amazon gift card so you can get your very own nifty mini-donut pan! No joke,I've been craving donuts all day! I like plain unglazed the best. So yummy!! my favorite are the old fashioned chocolate donuts and I also love the coconut crumble ones :) YUM! I am not sure I can give my favorite doughnut.. They are all so good... but I do like the plain baked with some cinnamon and sugar. I like any type of cake donut. I love the jelly filled ones!!! Thanks for the fun giveaway!! 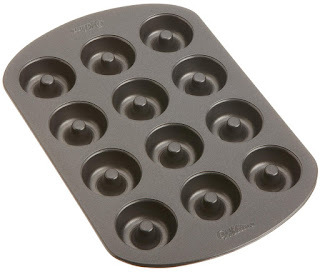 You know, I had a $10 Amazon GC and I had this donut pan in my cart yesterday, but I decided to buy something else instead. It is so weird that I ran across this giveaway! I love maple glazed donuts... I want one right now!!! I love crullers and of course chocolate iced. I like a vanilla glazed donut. Glazed cake donut is my favorite. Sugar donuts are my favorite!! I love applesauce donuts - thank you! This recipe will make life so simple!